Casters are getting some fantastic spell animation changes on the patch 7.3 PTR. So far we have changes included for Restoration Druids, all Mages, all Priests, and Elemental and Restoration Shamans. Warlocks are being worked on but aren’t ready yet. Most of the updated animations seem to revolve around better spell effects with new glowy outlines and a new floating animation. Shadow Priests are noticeably a work in progress and missing textures, but the new Shadow and Void forms are in and as purple and dark as ever. Holy Priests seem to have received the largest overhaul as far as casting animations go. Frost Mages are a close second with regards to the spell graphics that were updated. Wowhead has been putting together videos of the changes, along with side-by-side examples of the PTR spells versus spells on the live client. They use the Inky Black Potion in order to make the spells stand out. Completely revamped spell effects for Frost. Of the Mages, Frost had the biggest change, with many of their spell effects redone to fit the class better. Gone are the “generic blue glow” and snowflake effects for the spells. You’ll notice they’re much more icy and sharp with sound effects to match the harsh ice. Updated and more detailed spell effects for Arcane. New casting animation and graphics for Arcane Explosion, similar to the new Holy Nova. Fire spells have better graphics and new glowy effects. Revamped animations and effects for Prayer of Healing, Holy Nova, Divine Hymn, Levitate, Mass Dispel. 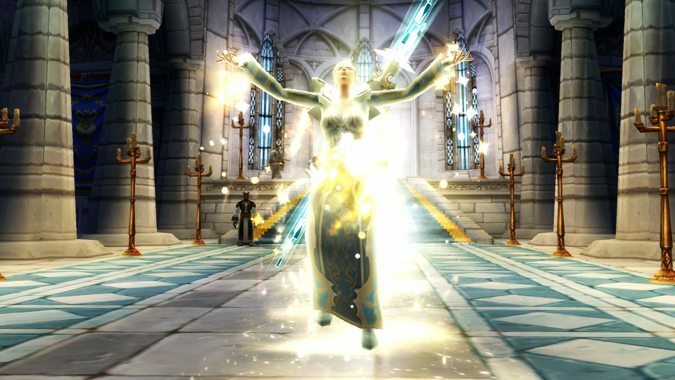 New spell effects for Holy Word: Sanctify and Heal. New spell effects for Smite, Penance, Power Word: Barrier. New casting animation for Power Word: Barrier as well. Biggest changes so far: Shadow and Void forms are very shadowy. Mind Blast, Shadow Word: Pain, and Vampiric Touch now have noticeable black and purple effects on the target rather than a generic smoky blast. Void Bolt and Mind Flay have updated spell effects. New spell effects: Chain Heal, Healing Rain, Healing Wave. Chain Heal looks amazing and has some fancy new sounds that make it sound as shiny as it looks. It also leaves residual sparkles where it jumped so Shamans can finally start to feel as sparkly as Priests. New spell effects: Lava Burst, Lightning Bolt, Chain Lightning. New casting animation for Wild Growth, Efflorescence, Flourish, and Tranquility. New spell animation for Swiftmend, Lifebloom, Regrowth, and Rejuvenation.